More battling through the snow on March 3rd! This time for the beautiful wedding of Joe and Jeff who were married at the always gorgeous Blake Hall, Ongar. Very honoured to be part of Blake Hall’s first wedding of 2018, after their Winter closure for refurbishment. I must say, the barn looked spectacular! 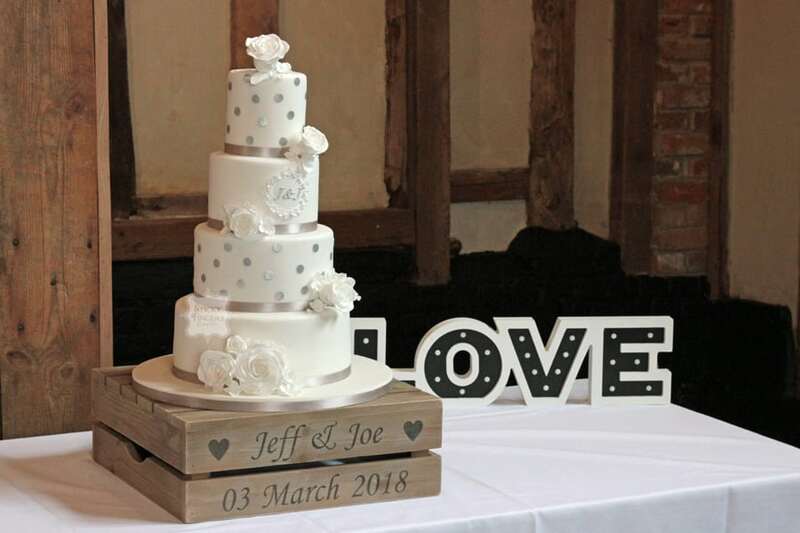 Joe and Jeff chose to have a four tier iced wedding cake with a silver a white colour scheme and lots of sparkle. Their yummy flavours were Traditional Fruitcake, Rich, Dark Chocolate and Madagascan Vanilla & Raspberry with a dummy tier on top. I decorated it with white sugar roses and blossoms and silver edible dots. Huge congratulations to you both and wishing you so much happiness for the future.